After Presidentiables Grace Poe and Jejomar Binay conceded first on their race this Election 2016. This afternoon, LP standard bearer Mar Roxas has now submitted his defeat to soon to be the newest President of the Philippines Rodrigo Roa Duterte. He proclaim his defeat in national television, thanking all of his avid supporters, friends, family and everyone in Liberal Party who has been there to guide and help him all through out this 2016 Election. Senator Grace Poe, "Ako si Grace Poe...ay nagbibigay-daan kay Rodrigo Duterte...na siyang napili ng nakakarami sa ating mga kababayan. (I Grace Poe, I'm giving way to Rodrigo Duterte, who was choosen by most of our countrymen.)" Former DILG Secretary Mar Roxas, "Digong (Duterte), I wish you success. Ang iyong tagumpay ay tagumpay ng ating sambayanan at ng ating bansa (Your success is also the success of our people and so with our nation)." Current Vice President Jejomar Binay, "I have repeatedly called for respecting institutions and the democratic process. Once the process is completed, we should always respect the outcome. We should all move towards healing and unity for our divided land." It's a good thing that all went well after having a silent but rapid war online caused by sparse support of the Filipino people. With them conceding their run in this election, all we need to do is wait for the proclamation of our next Philippine President. What do you think will be former Mayor Duterte could say to their speech? Share your thoughts below. 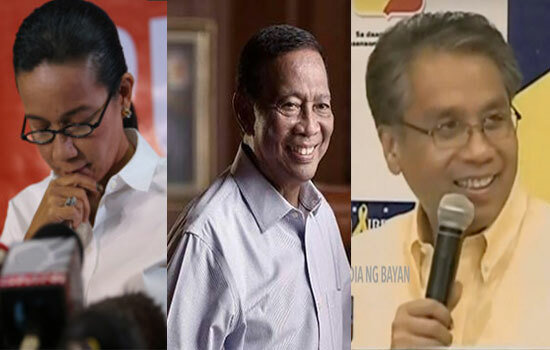 Comments or suggestions about "Senator Grace Poe, VP Jejomar Binay and Mar Roxas conceded" is important to us, you may share it by using the comment box below.